Personalized memory care at Artis Senior Living of Bartlett embraces Positive Partnerships the Artis Way. 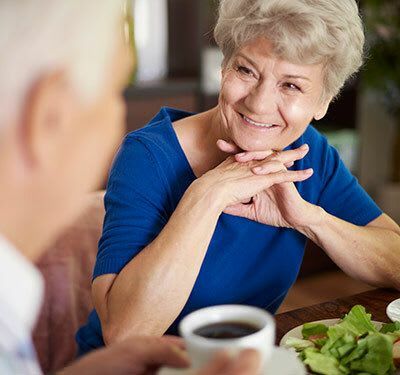 As a philosophy and practice, this allows us to use our experience to support two-way communication as an effective method for customized memory care. It’s important to us to ensure that residents feel connected to the resources they need and desire. Partnership Profiles, Town Hall Meetings, and Time to Dish meetings ask for and make use of resident input to enhance their experience. Ongoing communication and connection: that’s the Artis way. In addition to health and wellbeing services, housekeeping and laundry services help keep things fresh and clean. Residents enjoy delicious, chef-prepared meals that nourish and satisfy in the neighborhood dining room. Snack and hydration stations can be found throughout each neighborhood to provide a lift throughout the day. We incorporate contemporary research into our dining plans. Research indicates a Mediterranean diet may help prevent and slow the progression of Alzheimer’s and memory loss diseases. We’ve weaved these practices into our recipes and food preparation in order to provide residents with a holistic, caring approach to dining. Artis Senior Living of Bartlett offers residents a variety of programs intended to give them the opportunity to reach out to others. Connecting to others can play an important role in a resident’s care and wellbeing. Our Community Assistance Networks allows residents to participate in service to the greater community. The program offers the chance for residents to participate in outreach projects including letter writing campaigns for veterans or mentoring a reader. We offer Respite Care for those times when you need short-term support or a break in the routine. Come tour Artis Senior Living of Bartlett and learn more about memory care in the Chicago area.